I’ve said before on this blog that I’m not a big fan of excessive photoshop manipulation, but this image is certainly a notable exception. 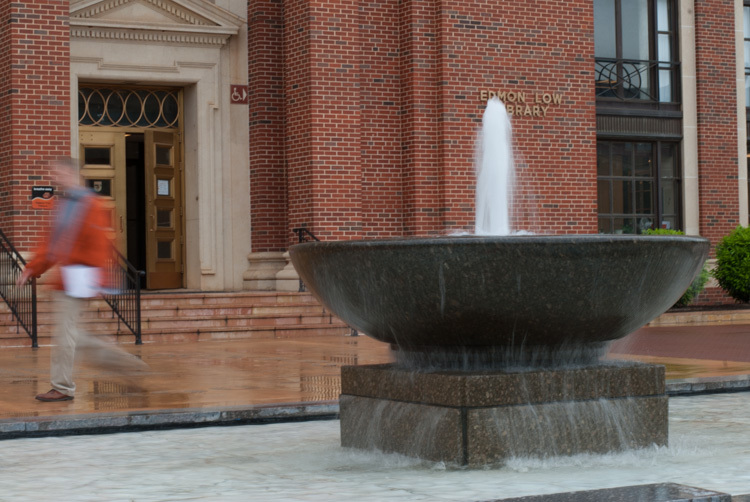 First, a bit of background: this fountain sits just in front of the main library on campus, and for a while now I’ve wanted to get a shot just like the one you see here with the water streaming while a passer-by strolled behind it. Shooting this with a 50mm lens presents some problems, the first of which is light or, rather, the overabundance of it. Without a neutral density filter to block out some of the incoming light, shooting at a slow enough shutter speed to get motion blur requires a super low ISO and super small aperture. On a bright sunny day an aperture of f/16 (the smallest aperture my 50mm lens will shoot at) and ISO 100 requires a relatively fast shutter of 1/30 or 1/60 which is far too quick to get the motion blur I was looking for. 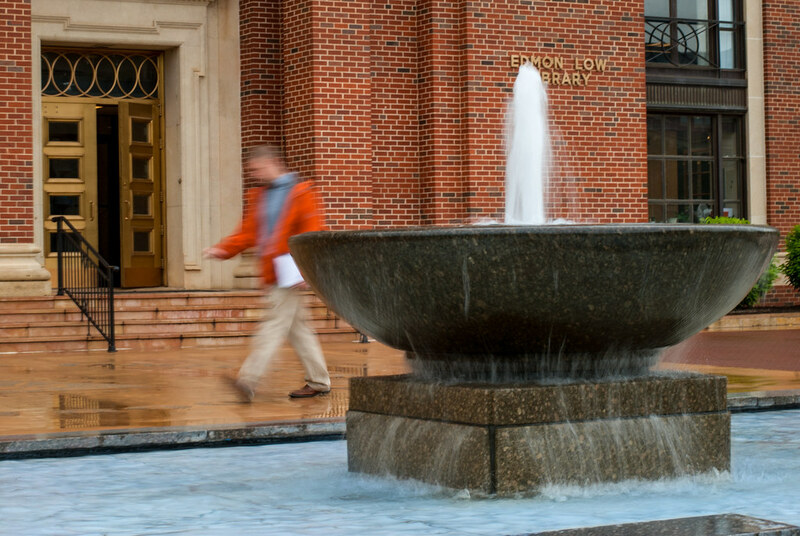 Another problem is that of proximity: a shot like this requires the photographer to be somewhat close to the fountain since prime lenses don’t zoom. And finally there was the human element, which was quite out of my control since I had to wait for someone to casually stroll by. The final image, then, is a composite of all three and since I was already doing plenty of Photoshop alterations I went all in and removed the signs and icons from the library doors. I figured if I had already committed to altering my picture, I would go ahead and make Lando Calrissian’s worth nightmares come true and alter it even further. Thank you for the post today. This situation involving the alteration of photos presents an unusual problem, legally speaking. When a picture is offered into evidence, the witness is usually asked, “Does this picture accurately reflect the (ITEM) at the time the picture was taken?”. Depending on the alterations, the answer would be, “No!”. 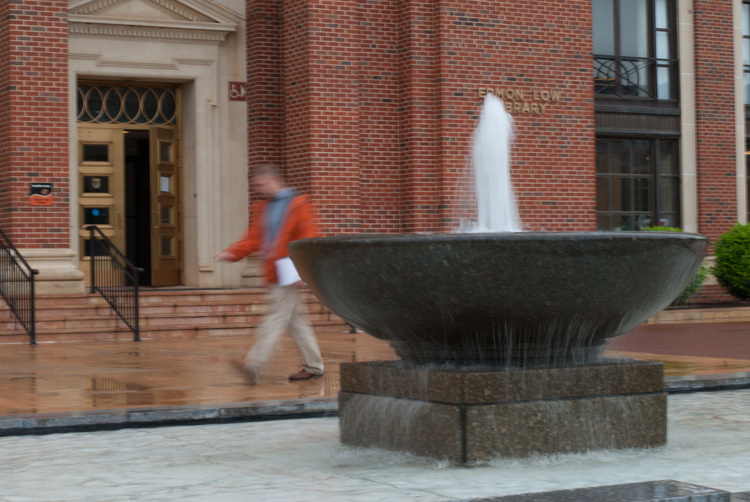 For example, the final composite picture of the fountain and guy walking does not have the signs on the door to the library. I would argue that it does not accurately then reflect the situation at the time the photo was taken. And, actually, you said this is a composite of three photos you took. In any event, how does one determine what, if any, photoshop alterations have been done to a photo? There is no negative. So, do you ask to see the memory card? Is there some data from the image that can be reviewed to show alterations? As you said, this opens a whole field of discussion! Thank you for your time. Thanks for your legal perspective on this, David. We live in interesting times, don’t we? Things aren’t just cut-and-dried when it comes to photographs or other media, and some publications don’t allow any edits including cropping a picture. The AP Code of Ethics for Photographers (see link below) doesn’t allow removal of red-eye, but it does allow minor photoshop alterations such as slight tonal enhancements. But then, one person’s slight alteration is another person’s inaccurate representation! I think that any amount of photo manipulation is just fine. The tools are there to be used. Personally rarely use them, but that is just due to personal preference. The only thing that it would be “wrong” is if a manipulated photo is being passed off as reality. If you are making it clear that the photo was altered then there should be nothing wrong with doing so. People should edit and use filters all they want, as long as they don’t try to hide that they did it. “Alteration”…hmmm….does that mean if I use a circular polarizer that I have “altered” an image? What about using a neutral density filter? But, lets not stop there. What about using creative lighting? The image is not the same as it would be under natural conditions. I will review the AP Code of Ethics for further information on this subject. Good job, Simon! This is an interesting topic. Good points, David! We could even go so far as questioning the use of black and white filters (or even black and white film) because the world is in color. It’s hard to draw a line in the sand and say “X is ethical, and Y is not” but it is a good practice to know why you are using a certain type of edit and making sure you are honest about it. National Geographic had so many people submitting altered images to their Your Shot segment that they recently just told everyone “Please stop.” But other publications like Vanity Fair, Rolling Stone, or Cosmopolitan practically require their images (especially the covers) to be heavily edited. Something to think about, for sure. As soon as you frame the image and decide what to include and what to exclude you are making an artistic decision about the image, even before you press the shutter release. I take photographs of buses. I can’t stand having a lighting column growing out of the roof of my buses and I regularly clone them out. However I’ve been asked to compile a book of my bus images from the 1970s and some readers may wish to use those published images as records of the times; the lighting columns will stay for those pictures. So to some extent it’s about context: is it artistic or is it representational? Only the photographer can make that call.